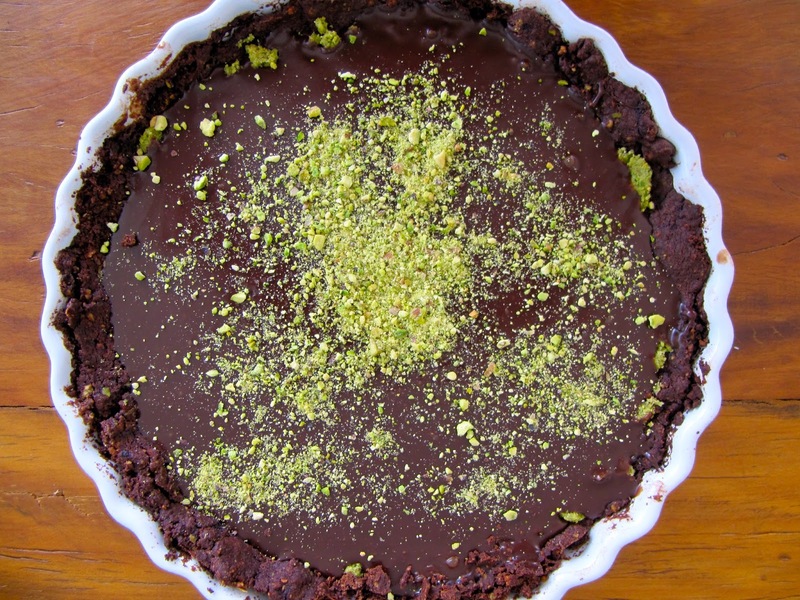 A delicious Milk Chocolate-Pistachio Tart (recipe here) to warm up the weekend! The flaky crust contrasts wonderfully with the creamy-melt-in-your-mouth filling, and the sweetness of the chocolate with the natural saltiness of the pistachios. I know I am a purist and can go on forever about not changing a recipe, but I just did it here, I substituetd the baked filling with a chocolate ganache one... oops! I am sure that the original recipe is absolutely wonderful, but I was so craving chocolate that I could not wait for a second baking and colling time, lol! Anyways, the tart is delicious! Eu fiz essa Torta de Chocolate com Pistache (receita AQUI) porque estava morrendo de vontade de comer CHOCOLATE! A torta fica deliciosa, a crosta de chocolate com pistache fica super delicada, parecendo de bolacha, e o ganache é de derreter na boca. Eu sei que posso escrever um ensaio sobre ser purista, mas desta vez mudei o recheio original da receita por um ganache simples porque não queria esperar o tempo de assar de novo, esfriar e comer, hehehe. Os contrastes da massa levinha e meio de bolacha com o chocolate que derrete na boca e do doce do chocolate com o pistache que é naturalmente um pouco salgadinho são divinos! Sugar, pistachios and cocoa for the crust. the most wonderful colors: chocolaty chocolate brown and pistachio green! The tart lasted for two days, that´s because I kind of rationed it. And I think this recipe would be just great for cookies!